Potentially stupidly overpowered ability: Script Kiddie - can use virus points at range (perhaps at increased cost as distance increases). That would be tricky, and pretty hard to program. We could make shop items half price as one, I guess. Or the shop carry something like 4x as many items... that one is really interesting actually! That way you can really control what you are buying. I think I will change her to that actually. I just got 35 DoomBots and 11 MasterMind Bots in the initial robot army in my current game on Normal. Yes, it's entirely possible. The robot army rolls 2 common, 2 uncommon, and 1 rare robot type, and then 2 bosses. The types of robots never ever change as you play through a city, it just collects more of them. So that's a pretty fearsome campaign you have there! I am a little - concerned - imagining what these 35 DoomBots will be like on Day 50 ! Yeah, all final battles are not created equal, that's for sure. But now that you know what your target is, you can at least kit out your bots accordingly. Or, you know, reroll. I'm blocked in by my own turrets and don't think I complete the mission without getting past them is it not possible to destroy turrets if necessary? Try holding down shift and trying to shoot one. That's the shoot the ground command, it might work. Right now you have to AOE them for some reason; a shotgun blast next to them will get them, for instance. Turrets are pretty buggy at the moment, apologies. They are actually next on my list right at this moment. Thanks for that I used the welding laser and it worked like a charm. I'd wondered about this part of the game myself. It seems to choose these bots entirely randomly, and some of the choices dont always make sense.... for example, having one of the main troops be EagleBots. All you have to do is get them to go in the wrong direction and you can ignore them.... not much of an enemy for a final battle. 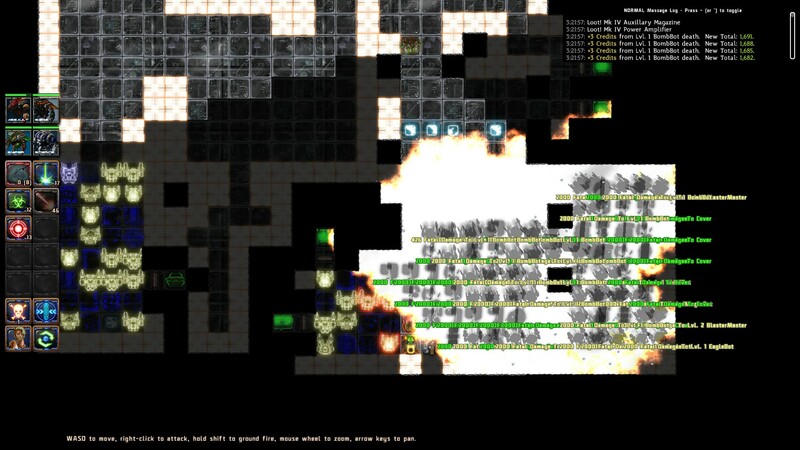 Such is the often absurdly random outcome of roguelikes. It's part of their charm. That's more or less my thinking as well. That said, if we explicitly want to ban certain bot types from being part of the final day, that can be done. Still, the eaglebots are only part of the forces in the final day, and you still do have to kill them, so it's not like the entire final day is a bust with them there or something. Ok, I think I have the best possible example of the reason to limit what bots can and cannot appear in the final battle, so that there's at least SOME challenge there, particularly since the game really builds up the idea that it's going to be pretty tough. And as the final battle, it SHOULD be tough. So. 45 days left to go. Expert mode. So I'm not at all far into the game, and I have not gotten any Epic Exos yet. Because I tend to do such things, I ignored the "DONT DO THIS YET" warning on an assassination mission, and dove into that next. 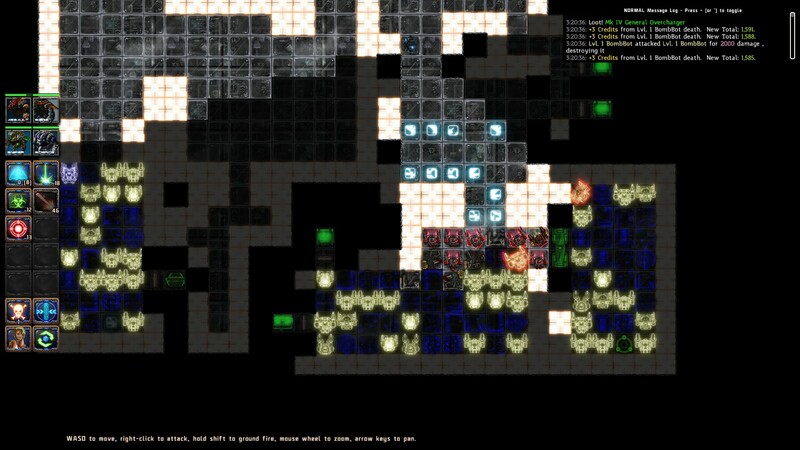 Containing 2 bosses, and lots of bots of the types used in the final army. Over the entire mission, I took.... 50 damage. I fired less than 10 shots in total. All enemy bots destroyed. The first boss died instantly. INSTANTLY. I had fired once. Just once. The second got half melted and I finished it off with 3 rockets. In other news, Expert mode is fun. Havent lost any Exos yet but avoiding damage is much tougher so far. The only Exo that ever gets blown up is my Siege guy, and that's only if I'm not paying enough attention when I fire the rockets; usually when I dont realize that I'm standing near some of those thunder runes or whatever they're called. Other than that, I'm tearing through each mission pretty quickly. Avoiding damage entirely is a good bit tougher, and there's more "threatening" bots than before, such as the damage/defense/movement buffing bots, but there could be more threat. One definite thing: The siege bot's rockets are stupidly powerful. So very much damage, affecting so very many tiles. Every splash damage increase making it even more absurd. Some missions can be beaten with only a few of these. Also, as pointed out here: http://www.arcengames.com/mantisbt/view.php?id=12416 I dont think Expert mode is increasing enemy levels quite right. Levels though, for the enemies, honestly I dont think they do enough. Many of them dont increase in threat all that much at all when they level up, which also has the side effect of making the factory missions seem a little pointless. It seems like any given enemy bot needs ALOT of levelups to become distinctly more dangerous, and of course during that time my team is increasing in power faster than the bots are. Player stats though, are feeling quite well balanced, even if some base weapon numbers (like the rockets) could do with some tweaking. The various items seem nicely balanced, though there's a couple of types that seem underwhelming, but I'll wait and see how they are in the late game in this mode before suggesting anything. And a suggestion: Increase the "awareness" range of enemy bots in general with each difficulty increase. Simply increasing the number of bots per level only does so much when only a certain amount of them can ever come at you at once. * BombBot, EMPBot, AvalancheBot, BatBot, EagleBot, and GaffeBot are no longer allowed to be in the final battle. NOOOOOOOOO!!! Obscenely large explosions and hilariously destructive friendly fire incidents, I'll miss you ! You should seriously include some dev tools/cheats to allow players the opportunity to do this, though. As the soldiers in AVWW2 can tell you, explosions are highly therapeutic.